No, I didn't solo in the suit, haha. This was taken right before my second solo today, in front of the aircraft I did my first solo in on Friday. I wasn't able to get a photo day of and was giving a presentation today, hence the suit! Nope, Ramp Supervisor for SWA, lol. I very rarely wear the suit. One of my classes is taught by a retired USAF LtCol, and suits are mandatory when giving presentations in that class. There were a few folks looking sharp on the ramp this morning! Congrats, fitting because I'm about to fly with a guy who has his shirt collar linings re-done with Auburn logos. I'm pretty sure he's going to change into his Auburn sweats and slippers too! Enjoy the ride! Normally I’d congratulate you...but Auburn. May you have many more happy flights and Roll Tide. Did your CFI cut the back of your suitcoat? I love how over half the posts turn into "War Eagle" or "Roll Tide". 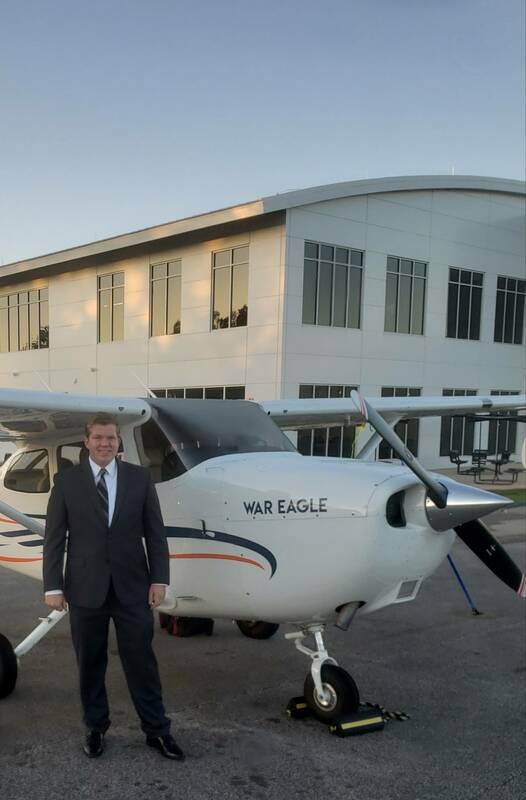 Congratulations on the solo and War Eagle! Congrats!! I did my first solo in 280ME. Not sure if they still have that tail or not!! War Eagle friend!! I for sure didn’t do my solo in style. Bossed it in a suit!! The new flight uniforms are sharp. But how do you know who is captain and who is co-pilot (or "first officer" in today's PC terms)? War Eagle! Congrats on the solo and keep it up.